Inside, it's divided into a public bar and a saloon bar. The saloon bar is quite nice, with a solid-colour carpet, tealights on the tables, and a cosy banquette seating area towards the back photo. Two or three board games are available for customers. Kake visited on a Thursday evening in September 2009. 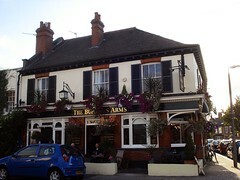 Three real ales were on; Sharp's Doom Bar (£1.50/half), Twickenham Sundancer (£1.50/half), and Young's Bitter. The fourth pump had its clip turned around. The two I tried were fine. Scampi Fries were 60p. When I arrived around 5pm, it was just me and one other customer, but a few other people drifted in slowly while I was there. The flatscreen was showing sport with the sound off, and an All Saints CD was playing. Food is served noon-2:30pm Mon-Fri and 12:30pm-2:30pm Sun (Sunday roast), according to signs seen outside in September 2009. There appears to be no food on Saturdays. Last visited by Kake, 10 September 2009. Opening times taken from the 2010 Good Beer Guide. Last edited 2013-05-10 06:51:02 (version 7; diff). List all versions. Page last edited 2013-05-10 06:51:02 (version 7).